Most tech workers responding to a recent ASHA survey say they limit their own and their children’s use of technology. They also think prominent industry figures should speak out about tech overuse. Survey respondents were nearly 200 people who attended the 2018 International Consumer Electronics Show (CES) in January. 88 percent think prominent industry figures should speak out more about tech overuse. Nearly 67 percent said children should not be allowed to have their own personal tech devices until age 10 or older—this amid a societal environment where new tablets, smartwatches, and other devices are being heavily promoted for even the youngest children. Almost a third (30 percent) said children shouldn’t even use devices until age 10 or older. 68 percent see parental/household parameters as the most realistic solution to preventing kids’ tech overuse. 86 percent would attend a venue, restaurant or social gathering where personal device use is prohibited. “One of the most fascinating aspects of these results is that the very people who work to design and market these products seem to be very concerned about the effects of this technology—and perhaps more dedicated to managing their own and their families’ usage than the rest of us,” says Elise Davis-McFarland, 2018 ASHA president. “Among our concerns as communication experts is the potential impact on speech/language development in young children,” Davis-McFarland says. “It’s not the technology itself, but how it is being used and what it is taking away from when it’s being used. If used interactively with parents, and it is not detracting from time children spend talking, reading and interacting with loved ones, it isn’t necessarily problematic. But when it’s supplanting these critical opportunities for verbal interaction, which is how young children learn to communicate, that is worrisome. About half of the CES survey respondents are parents. 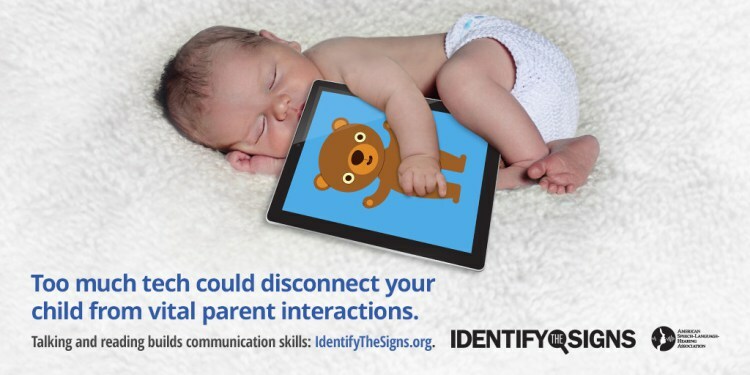 Nearly three quarters of those parents said they prohibited technology at the dinner table, social events or similar gatherings, and 68 percent set device time limits for their children. About 70 percent are interested in using apps or other tools to help manage their kids’ tech use, and 61 percent are interested in establishing tech-free areas of their house. But 55 percent of the parents said that their own busy schedule—which makes it difficult to monitor tech use and keep kids occupied—poses the biggest challenge to managing their children’s tech use. That may be why so few (8 percent) say they “always” use tech interactively with their kids. Francine Pierson is an ASHA public relations manager. fpierson@asha.org. As the parent of a child on the spectrum I have had to fight from losing him in the world of screens. To him it seems safer and more fun in that world. I’ve set very strict guidelines though, and worked hard to have non-screen iterations of his interests (i.e. magic the gathering CARDS, not just games online etc.) and we have had some success. It seems like even typical kids these days are losing skills and health to this phenomenon.